Create and share a community calendar with Teamup! It’s easy. Let groups collaborate, share the calendar securely with the public, and promote events. 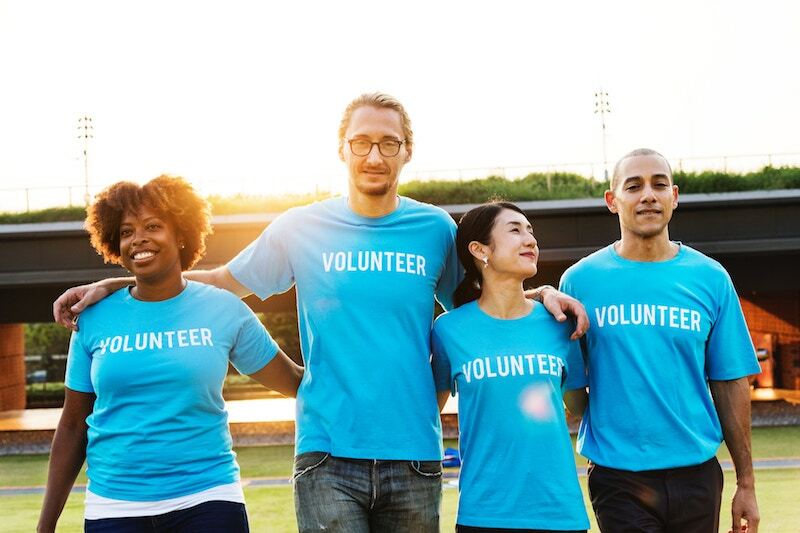 With Teamup, you can create a calendar for your community, hobby or special-interest group, or other organization, and securely share it with the public. You can also use Teamup as a collaborative community calendar, where multiple groups or individuals can add events to the calendar. First, create a free calendar. The Basic version comes with eight sub-calendars. If you need more, you can upgrade to a paid subscription level at anytime. Next, decide how to organize the sub-calendars. You might create one sub-calendar for each type of community event, for example. Or you could assign a sub-calendar to each group or organization that will be involved. Finally, create calendar links for all collaborators. Will you be asking other individuals to add events to the calendar? Or do you want to share calendar access with other groups, so they can add and update their own events to the calendar? To create calendar links, go to Settings > Sharing. Then click the blue New Link button in the top right. Name the link for the group or individual who will be using it. Then scroll down to select the sub-calendars to include, and the access permission for each one. For collaborating, it works well to give each group modify access to their own sub-calendar, and read-only access to all other sub-calendars. That allows them to add and update their own events, but only view the events that other individuals or groups have created. Read more about using calendar links and access permissions. When you have the calendar all set up, you can share it with the public via a secure, read-only calendar link. 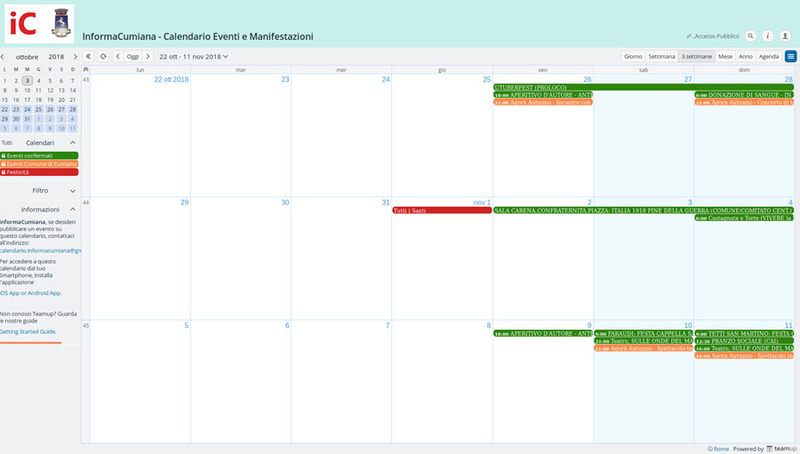 This will allow people to see all the events on the calendar, and view all event details. But they will not be able to change anything on the calendar. If you have some sub-calendars that you don’t want to include in the public link, you can select the sub-calendars you want individually and set the access permission for each one to read-only. Now you can share that calendar link via any means that is convenient: you can send it in an email, share via social media, or embed it on your Facebook page or website. It’s up to you! We’ve collected a few great examples of shared community calendars for inspiration and ideas. The Plattsmouth Public Library’s shared community calendar. 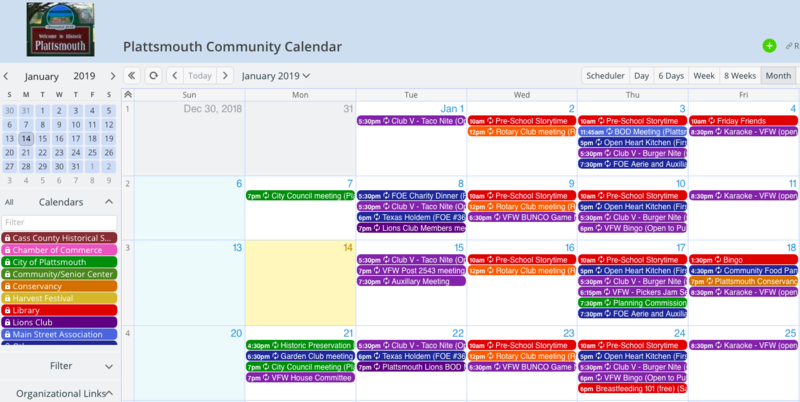 The Plattsmouth Public Library set up a shared community calendar that multiple organizations and groups use to keep community members informed about events, area opportunities, and updates. The library staff often took calls and inquiries about area events and decided it was time for a more efficient system. They created a Teamup calendar and invited major community organizations to collaborate. The library staff takes care of adding events from smaller group and area organizations. Now the community calendar is a helpful tool for all members of the community, and is kept updated by efforts from multiple groups. No one person or organization is overloaded, and event information is easy to find for everyone. The public calendar, shared via a secure read-only link, is available via a link on the library’s website. Other community organizations also share the calendar from their own websites or social media pages. Events can be shared easily via social media, messaging, email, or as stand-alone webpages by any member of the community. Each major community group has its own sub-calendar. Another sub-calendar, managed by the library staff, is dedicated to events from smaller groups. The About box on the left sidebar has links for all the major community organizations. The municipality of Cumiana, Italy, uses a shared calendar for public shows and events. Their calendar allows event organizers to update information in real-time, and keeps the public updated on area events. They have a unique method of using the calendar that helps various individuals and organizations schedule events for the area with less overlap. That way, more people can attend more events. There’s less “competition” between events, and more opportunity for everyone to enjoy all that the area has to offer. The organization or association… can enter events independently, with an easy-to-operate system, directly in the work calendar. They can add useful and essential text or images: descriptive details that, as soon as they are posted, become visible to other associations and organizations, as well as to the editors of InformaCumiana. In this phase the events will not be visible to the public just yet. Seeing various event plans and details on the work calendar allows organizers and groups to avoid scheduling conflicts and provide more opportunities for the community. Once the event details are confirmed, the event is added to the public calendar. Any association or organization can request a unique calendar link to have access to the calendar and add their own events to the shared work sub-calendar. The work sub-calendar is not visible to the public; it gives event organizers a way to collaborate on dates, and editors a chance to confirm event details before sharing publicly. There are sub-calendars for various event types, such as national holidays and festivals. Events, once confirmed, are added to the appropriate sub-calendar. 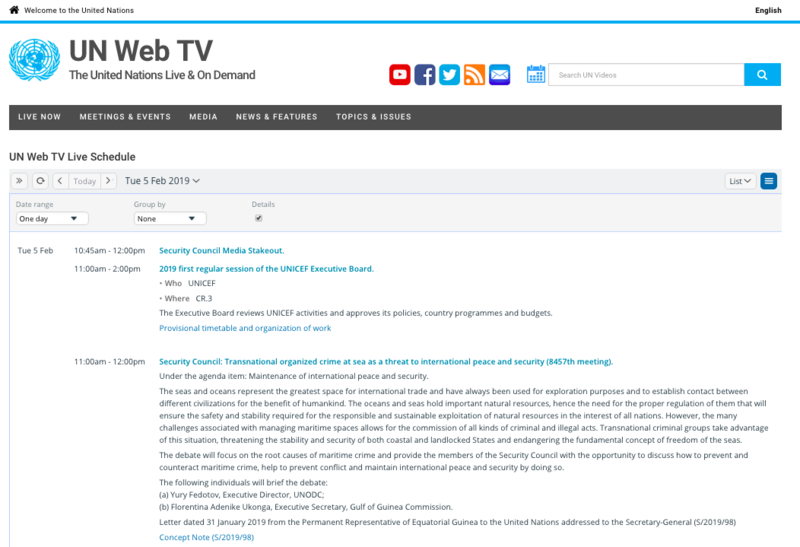 The public calendar for UN Web TV is embedded on their website for easy access. UN Web TV is the video portal of the United Nations Webcast. It broadcasts daily, live and on-demand video coverage of United Nations meetings over the internet. UN Web TV uses a Teamup Calendar on their website to share their program schedule; the calendar, embedded on their website, is easy for anyone to view or share with others. It’s a no-fuss way to keep the public informed about the video coverage. The embedded calendar is shown in List view, with event details on. This default view makes it easy for website visitors to scroll through the day’s programming without needing to open individual events for details or links. Viewing options at the top of the embedded calendar. Event details are easy to see in the List view, with details enabled, which is the default view of the embedded calendar. On the event details, UN staff includes links to various viewing options for each event. The embedded calendar shows in the local time zone of each calendar viewer, so everyone sees the programming in their own time zone automatically. The sidebar is hidden on the embedded calendar for a streamlined view. UN Web TV also offers an email subscription for the programming schedule; subscribers receive a Daily Agenda email with the upcoming day’s programming schedule. 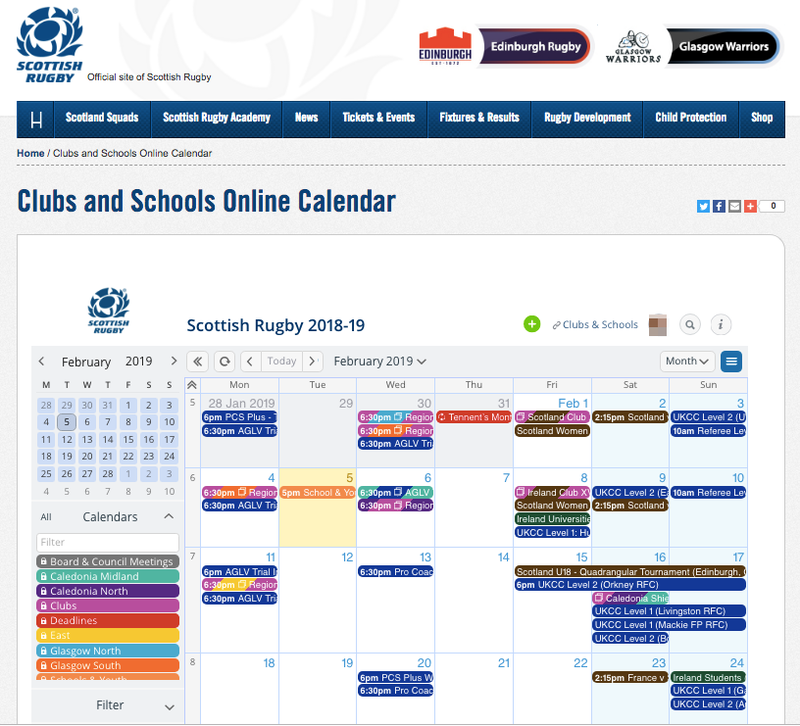 The shared calendar of Scottish Rugby shows school and club events. Scottish Rugby is the governing body for rugby union in Scotland. Their role is to do whatever it takes in order to grow the game and help it flourish in a manner that fits their values. Part of the way they grow and promote the game of rugby is with a Teamup calendar. 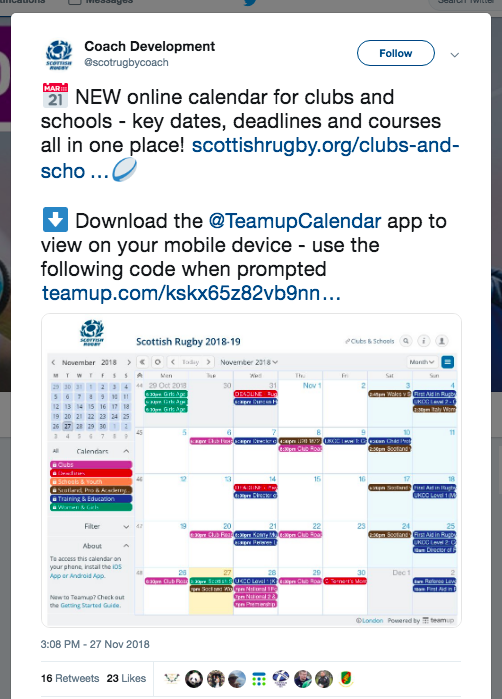 Their Teamup calendar is for clubs and schools, showing key dates, deadlines and courses all in one place. It’s embedded in their website for easy access. They can use the calendar for coordinating their own training and coaching sessions, as well as sharing games and other events with the public. Easily promote and share events or an entire calendar. Different sub-calendars sort events into categories so fans, players, and organizers can find what they’re most interested in. It’s easy to share the entire calendar by copying and pasting the public calendar link anywhere. When appropriate, event details include a link to purchase tickets for the event. Anyone can share individual events from the public calendar by viewing event details, then choosing an option from the Share menu. Teamup mobile apps make it easy for people to access and view the calendar on their mobile devices, as well as share events on the go. « What are read-only and read-only, no-details access permissions?